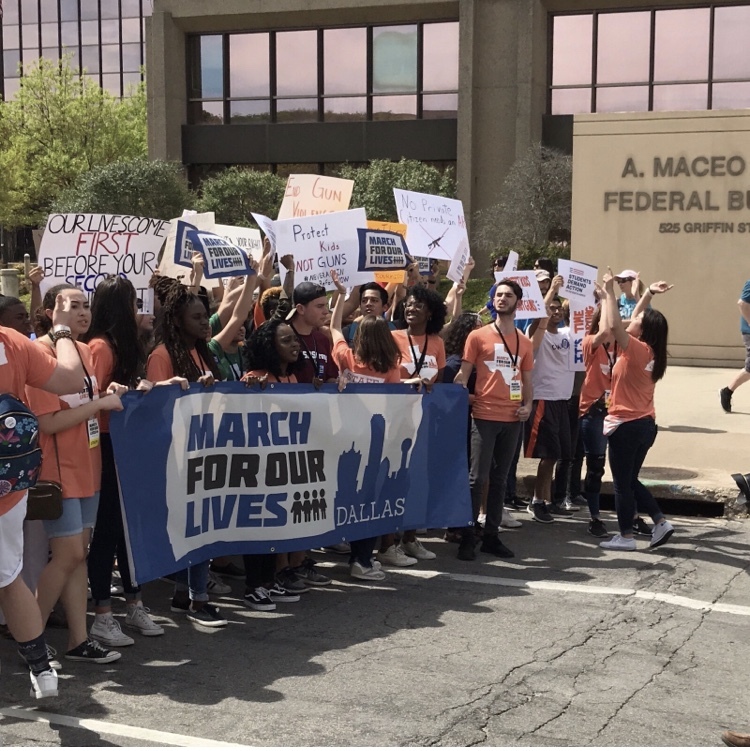 I attended the March For Our Lives Dallas on Saturday. It was REALLY hard for me to go. I felt like I was supposed to go, but there was so much holding me back, so much I was afraid of and so much I was unsure of. But, I was sure it wouldn’t be perfect. I kept trying to nail down why I felt I should go. What’s my part? Am I called? What am I actually going to accomplish by going? Is me attending going to be off putting? To the people I care about? To strangers? Is it going to make me uncomfortable? Others uncomfortable? Am I going to be judged? Worse, misunderstood? Have I analyzed my heart and my motivation? Am I pure enough? I joined Mom’s Demand Action in August of ‘16. (It was a summer full of violence, of the Black Lives Matter protests, and of the death of five Dallas police officers.) I’ve only ever been to one meeting, but their social media presence is strong in my feeds. I do fit into their target demographic, and so much of what they do resonates with me. But what I observed by going to a meeting and joining their social media groups, is that I still wouldn’t quite fit in there. While my heart was broken over the numerous school shootings, my heart was also breaking for the communities of color who have been plagued by gun violence for decades, often at the hands of police. At the time, I didn’t get the feeling that those demographics were who MOM’S was showing up for. The student organizers of the Dallas March for Our Lives asked the MOM’S to come dressed in red, line the route and to serve as “guardians”. This beautiful symbolism is what really drew me in. Right after the Stoneman Douglas shooting, two things happened. First, that week Eli’s kindergarten class got to go see a dress rehearsal for a play that Richardson High School put on. The day after they went, the high school got put on lock down because of a threat. All I could think about, was what if Eli was in that school? How traumatic would that be for him? For his teachers? Or would it even be? I know he’s done lock down drills in his own school… this is just part of his reality. That week, 5 schools in the DFW area had threats (or false threats) that resulted in lock downs. It’s part of all students reality. Secondly, the church/preschool that Theo and Bennett go to had its windows shot at. It didn’t penetrate the inner layer of double pained glass, so was probably only an air soft gun. The church hoped it was a random act of vandalism, as the neighborhood nearby had also reported vandalism. But it happened when their marquee read “How long, oh Lord until our congressmen act to prevent gun violence”. And then it happened a second time. It was very clearly an act of intimidation and violence. These were very mild incidents, but they are the closest I’ve come to gun violence. I have had too many friends and relatives touched by suicidal gun violence. The bottom line is no American is immune to gun violence. Still, I was so afraid of showing up, and being judged. Or showing up and being misunderstood. How would anyone there know what I was really there for? How would they know that violence against people of color, women, and children is my motivation? I didn’t really feel like I belong, like I can really identify with any one specific group at the march. I didn’t ask any friends to go with me, because I know this isn’t a big issue for them. I asked my husband to go with me, but I knew he wasn’t really interested. I assumed that attending was going to make me feel more alone, even though I know that these things do in fact literally bring people together. I was just afraid. Showing up also meant I had to confront my own biases. And I found a lot more of them than I’d care to admit. I have prejudice against republicans, evangelicals and the bedfellows that they’ve become; gun owners I don’t see as responsible because they don’t lock up their guns; feminists who aren’t intersectional; people who are showing up but have a white savior mentality. These aren’t unfounded. But there HAS to be grace and mercy. I had to acknowledge my white privilege while not letting it turn into crippling white guilt. I also had to look at my own tendency to have a white savior mentality. Especially as it relates to my childrens’ schooling. (My oldest son attends kindergarten in the historically black neighborhood of Hamilton Park.) I have had the thought that because I send my white kid there, the black and brown children are getting a better education. It’s so complicated with it being a magnet school. Is it a magnet because of a desegregation lawsuit? Is it a magnet because it’s such a big campus and they needed to fill it with more students? Does it even matter why it’s a magnet school?!? Diversity is important to me. Racially, ethnically, socio-economically. So sending my children there does line up with my values. It is a tangible way that I can act against perpetuating white supremacy. Even if it’s not perfect. Even if I’m not perfect while doing it. I can’t let perfection be the enemy of good. I can’t wait until I’m perfect to show up. I can step out in the muddy middle. So, after hours of going around and around and around in circles about why I should and shouldn’t go, and after what felt like a silly amount of tears shed, I showed up. I showed up in a red Hamilton Park Pacesetter Magnet shirt. I showed up heavy hearted. I showed up for universal background checks. I showed up for a ban on bump stocks. I showed up for a ban on high capacity magazine clips. I showed up for common sense gun control. I showed up for the people who couldn’t show up. I showed up as the person I’ve needed, a MOM’S guardian. I showed up as myself.